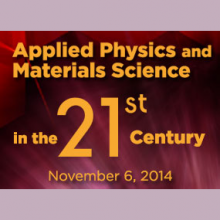 The Applied Physics Materials Science Department is hosting a day of “connections and discovery” for its alumni, faculty, staff, and current students on November 6th, 2014. Please join us for an exciting event that includes faculty talks, poster sessions and a panel discussion, as well as a talk by keynote speaker, Dr. Arati Prabhakar, Director of DARPA (Defense Advanced Research Projects Agency) and Caltech Applied Physics alumna (M.S. ’80, Ph.D. ’85).